Thread chasing is no longer viewed as the arcane art it once was. The aura of mystery has well and truly been debunked and it is being integrated into myriad projects. 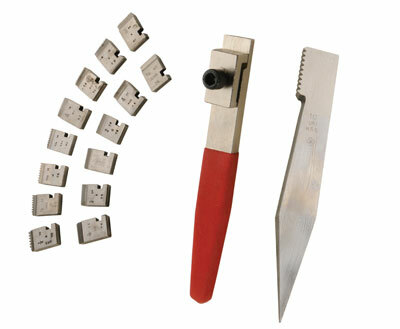 The question asked most often is, "where can I get a good range of thread cutter sizes from?" Most turning tool manufacturers will sell about four sizes of male and female threads, but Tracy Tools have looked at this and provided about 20 thread sizes. Now, there is a difference. These are engineering HSS thread chasing heads, which come complete with a holder. The external chasers are supplied as a mixed pack of 13 heads which lock into metal handle. The threads, depending on the set bought, go from 7-72 tpi; that's a wide selection. The heads can also be used on engineering lathes in the cross slide bit holders. Internal chasers are sold individually and are unhandled, so you will need to make your own wooden handle. It was an easy process to clamp the heads into the metal holder, which also has a rubberised handle. I was sceptical at first of how the tool would feel, but I was pleasantly surprised. The head is well secured and I was able to manipulate it on the rest as well as the more conventional chasers. The big difference is that the male chasers have a concave section- rake behind the cutting tips, a large one at that, which is standard practice for engineers. It does however, make the chasers a little 'grabby' in wood. I just flattened off the teeth a little on the top with a diamond file run across it. The grabbiness immediately stopped and I was able to nicely execute cut threads. I liked the wide selection of threads available and these are likely to be a boon to woodworkers and model engineers alike. 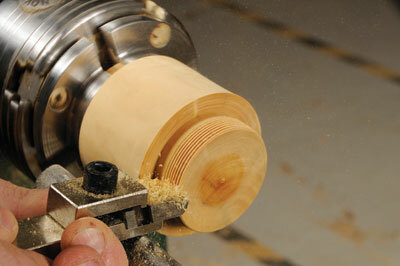 "These are likely to be a boon to woodworkers and model engineers alike"